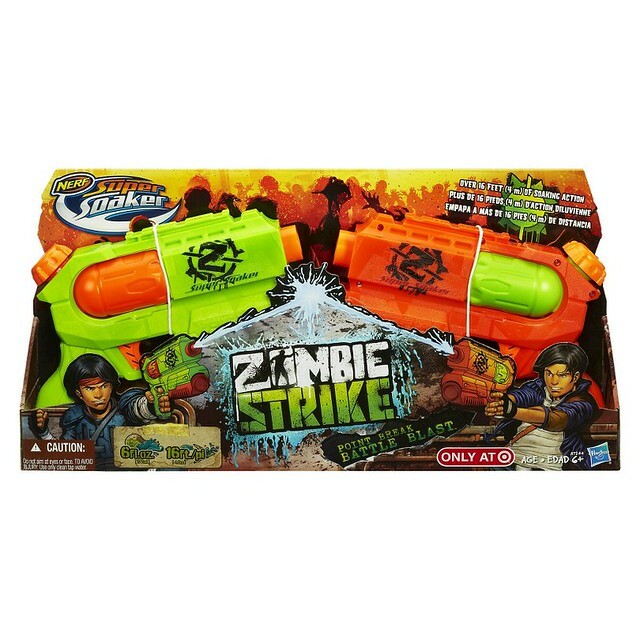 What do you get when you combine the new Zombie Strike line and the old Super Soaker line technology? You get colorful water blasting fun apparently. 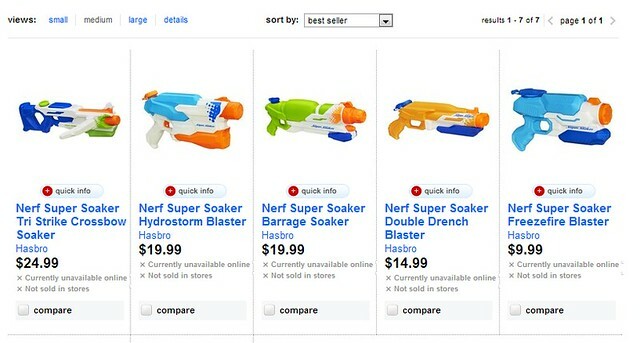 Thanks to a Target web listing once again, we have some new information on upcoming an Super Soaker. Product description can be found below. 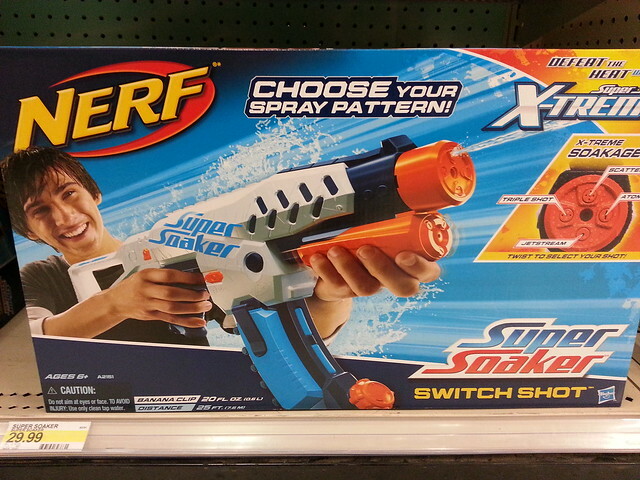 Thanks to the heads up of Buff Daddy Nerf and the Target website, we now have images, prices, and product descriptions for the upcoming Spring 2014 Super Soaker line. The designs seem to have taken a step back in terms of visual quality. 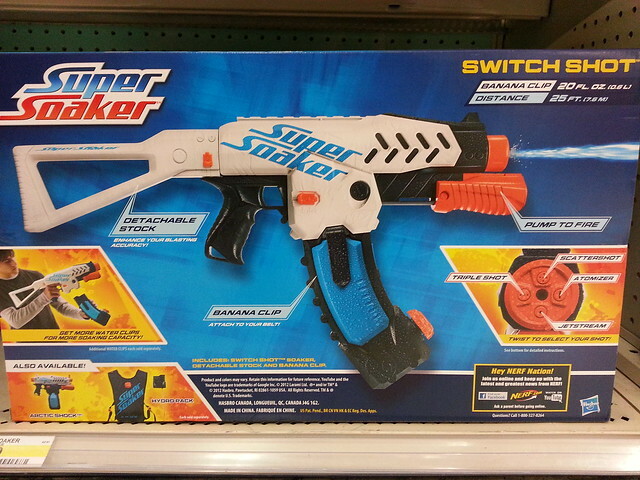 These also still seem to be piston powered instead of the older, farther firing air/pressure powered Super Soakers. Hit the jump to see info on these 5 new Super Soakers. I decided to buy the 2011 Tornado Strike off Amazon for it’s stock. I figured I’d make an unboxing video, a slow motion firing test, and show off what it looks like on the Stryfe for everyone. 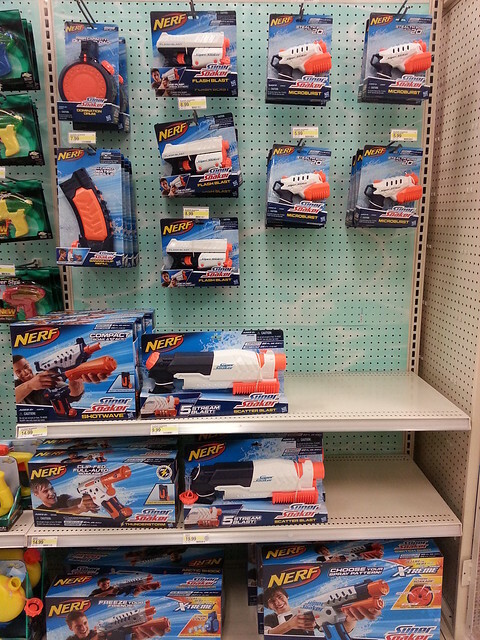 Earlier this week while making a camera inspired trip to Target, I was a bit surprised to see the new 2013 Super Soaker line in stores. I was also surprised since it’s still Winter in the USA, and Hasbro/Nerf usually releases their Super Soaker line in the Spring. 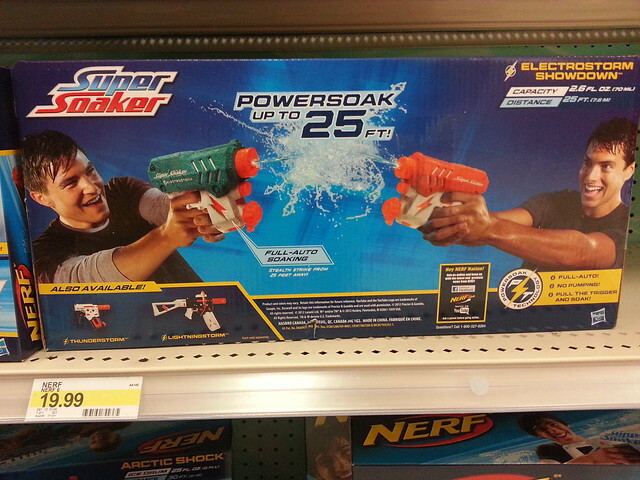 Whatever the case, I got around to taking pictures and getting prices for the new Super Soaker stuff they had there. 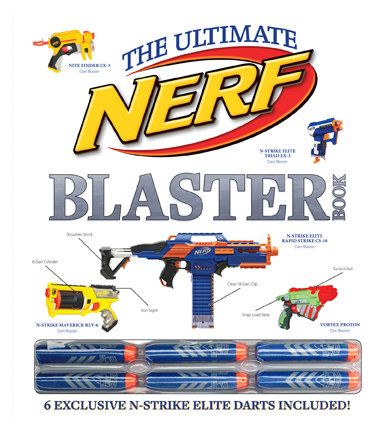 Products Descriptions are from the Nerf site. 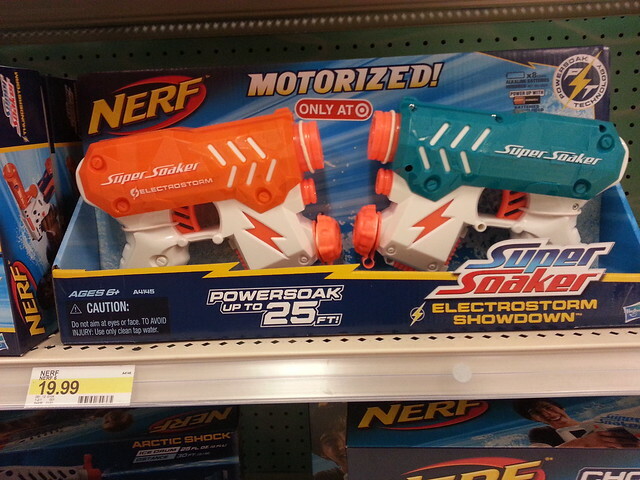 February 6, 2013 EDIT: Spotted a new Nerf product going for $19.99 called the Electrostorm Showdown. Choose your spray pattern and soak your competition 4 different ways with the SWITCH SHOT water blaster! Want to send 3 streams of water at them from up to 25 feet away? Launch an atomized mist attack? Or just massively soak them? Just twist the knob on this versatile blaster to choose Scattershot, Triple Shot, Atomizer or Jetstream mode and then pump to soak away! The SWITCH SHOT blaster holds up to 20 fluid ounces of water in the banana clip; you can attach extra Banana Clips (extra clips sold separately) to your pants or belt so you never run out of ammo. Enhance your blasting accuracy with the detachable stock. Choose your attack and launch the extreme soakage with the SWITCH SHOT blaster! 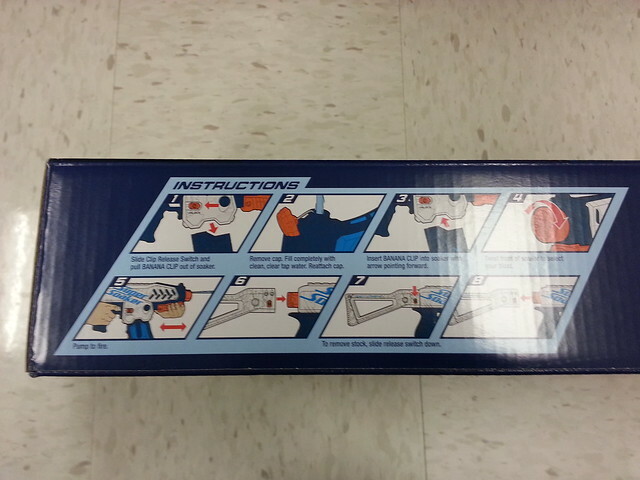 Blaster comes with detachable stock and banana clip.